Two women suffered serious head and facial injuries after being attacked and robbed by two other women in a West Lothian street. 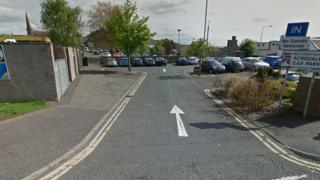 The victims, both aged 23, were walking between Hopetoun Street and Hopetoun Lane in Bathgate at about 03:00 on Sunday when they were assaulted. One of the women also had a number of items of make-up stolen, along with her black high-heeled shoes. It is thought all four women may have met earlier in the Envi nightclub. The attackers were last seen near a car park in Hopetoun Lane. One of the victims was released from hospital after treatment, while the other remains at St John's Hospital in Livingston. The first suspect is described as a white woman in her mid 30s. She has a medium build, is about 5ft 3in tall and has dark shoulder-length hair with blonde highlights. She speaks with a local accent and was wearing a black off-the-shoulder top with a floral print and black skinny jeans. The second suspect is also a white woman in her mid 30s. She is about 5ft 3in tall with a large build and dark hair. She was wearing a pink bomber jacket. Officers were also keen to speak to a man and two women who helped the victims shortly after the attack. Det Con David Bryce said: "This was a brutal and unprovoked attack, which has left the victims badly shaken and with serious injuries. "We are eager to trace the women responsible and wish to speak to anyone who saw the suspects in Envi nightclub. "Hopetoun Street was busy on the morning of Sunday, March 12, and we believe there may be witnesses who were in the area and who may have information. "We are also keen to speak to the man and two women that assisted the victims shortly after the attack."